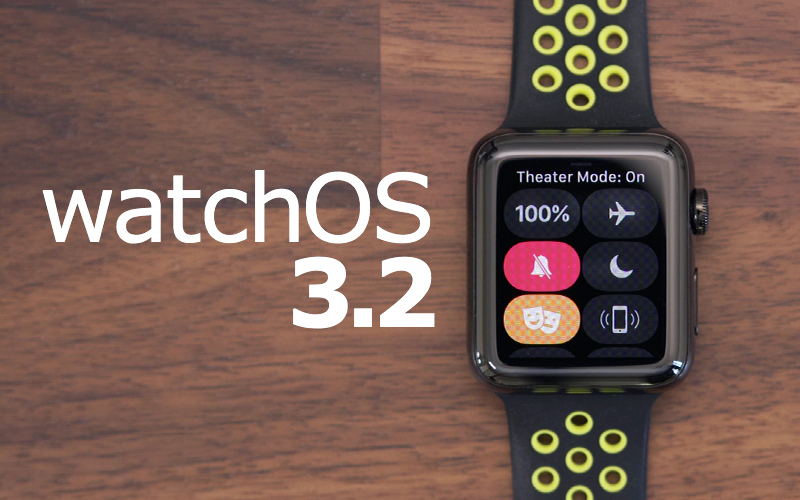 Apple today released a new software update for the Apple Watch, upgrading watchOS 3.1.3 to watchOS 3.2. watchOS 3.2 is the second major update to the watchOS 3 operating system that was released in September of 2016. watchOS 3.2 has been in testing since January 30 and Apple seeded seven betas ahead of release. watchOS 3.2 can be downloaded through the dedicated Apple Watch app on the iPhone by going to General --> Software Update. To install the update, the Apple Watch must have at least 50 percent battery, it must be placed on the charger, and it must be in range of the iPhone. watchOS 3.2 introduces Theater Mode, which is designed to let Apple Watch owners mute the sound on their device and disable Raise to Wake, preventing the screen from lighting up with arm movement. Apple Watch users are still able to receive haptic feedback-based notifications, and incoming information can be viewed by pressing down on the Digital Crown or tapping on the screen. The update also brings SiriKit to the Apple Watch, letting users ask Siri to do things like send messages, send payments, book a ride, log a workout, make a call, or search through photos. SiriKit has been available on iOS devices since the release of iOS 10, but is new to the Apple Watch.